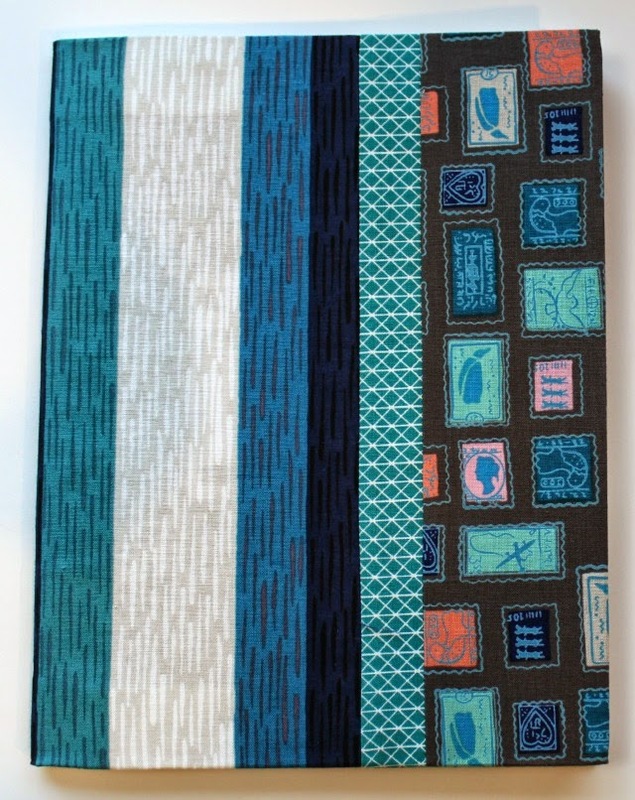 After making myself a patchwork sketchbook to take to QuiltCon, I decided to make a few more covered composition books as gifts. I used the tutorial by Stitched in Color for the basic instructions, and made up the actual patchwork on my own. For the first one shown below, I did use the North West block by hey, let's make stuff. 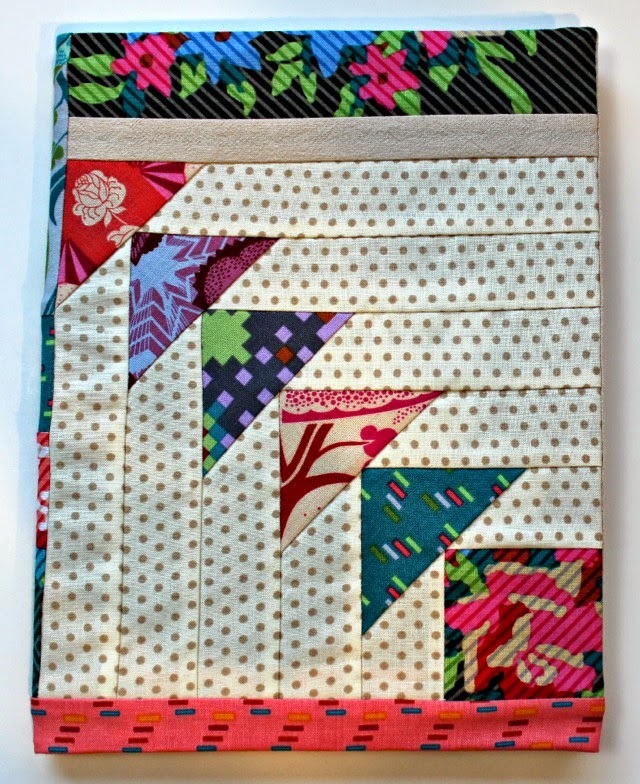 On one, I just did some improv piecing built around a wonky log cabin block. On another, I started with a mini version of shecanquilt's Canvas pattern and then did improve from there. I tried to make a more masculine version that wasn't quite so patchworky . . .
Then it occurred to me that the cheater-type C+S prints might be fun to try, so I made a couple more covers where 3/4 was made from 1 fat-quarter. By the way, I did make sure to hunt down composition books that had 4 squares/inch. Mine is already well-used from taking class and lecture notes. Any chance you could use one too? The first 4 shown above have all been gifted, but the final 2 - 1 with a fussy-cut flower and 1 with galloping horses - are up for grabs. If you'd like a chance at one, just leave a comment telling me which you'd rather have. I'll choose 2 random winners over the weekend. This time, U.S. only please. This giveaway is now closed - thank you! Thanks, Debbie! These sketchbooks are beautiful, creative and practical. It's hard to choose between the horses and the flowers... but since aqua and red is a favorite combination, and if I'm lucky enough to be chosen, I'd like the flowers. And thank you also for linking to Stitched in Color's directions. I'm still on the look out for graph paper composition books in my area so I can make a few too. Those covers are very cute. I made some for Christmas gifts this year too. Such a nice gift to give. I like the galloping horses best. Ooh, the flowers, please! I need some motivation to start sketching! I will definitely have to make some of these for my nieces. I especially love the fussy cut flower! I love all your designs! What a clever project. 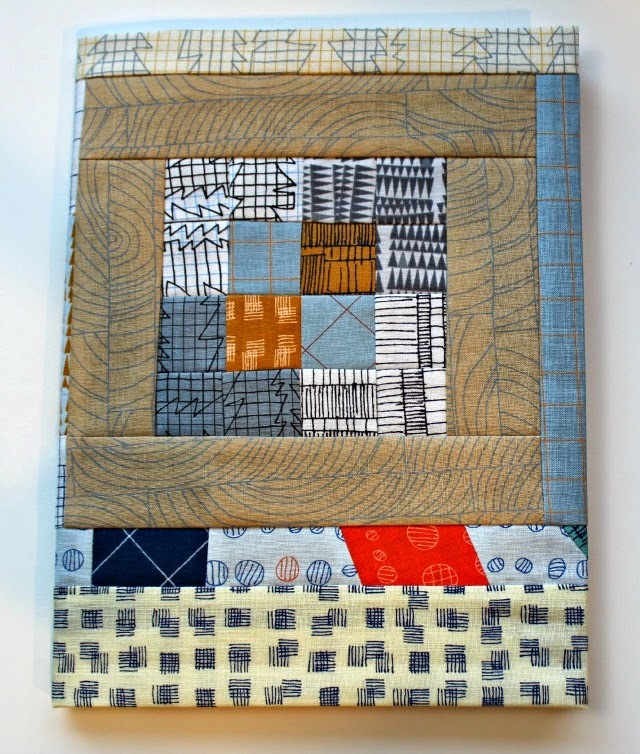 And I always love grid notebooks - they just go so well with quilt design! I love the flower cover but I also love the horse cover! Thank you for the giveaway!! Oops, my comment never posted. I love the sweet flower book but the horses are probably my favorite. I would love to find the graph paper composition books locally. I have spiral ones and the pages rip out too easily. Awesome covers, I need to try these and see how I do. Thanks for the chance! I'd love either. Thanks for the chance! What a nice giveaway! I would like either. Both are quite pretty. And to have a graph paper notebook is a bonus!! Thank you for this opportunity!! 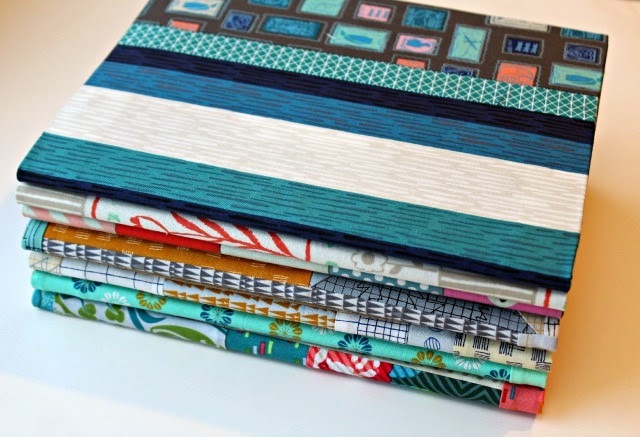 Note books are so useful for quilters! Love the horses! Horses because after all we were in austin, tx...cowboy country! Your work is always beautiful and I'm such a fan-real life and blog life too! They're all so beautiful! How generous of you to do a giveaway. :-) You know how much I love the horses! Love these notebooks, Debbie! I would choose the fussy cut flower! Congrats on your 2000 followers too! They are all so different and so cool! Love the running horses! These are all delightful and would be inspiring to use! So cute! I'd like the flower one. Thanks for the chance to win one! Mustangs! 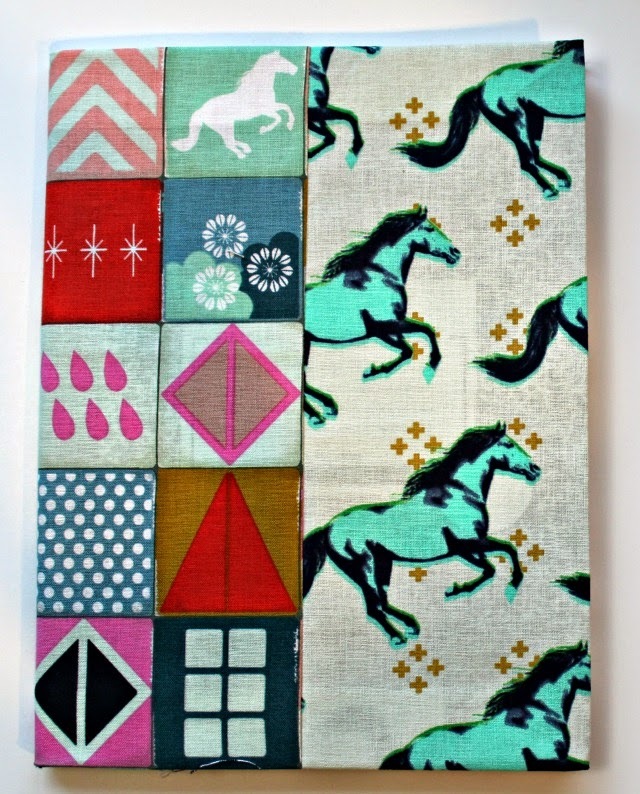 I love the way you put these fabrics together. Whoa! Ooh, fun! I like the flower one. Apparently, autocorrect doesn't like the word improv! these are just wonderful Debbie. I love the one with galloping horses. How generous, Debbie! All of them are wonderful, I especially like the galloping horses. No way! That's sweet! I love that last one. 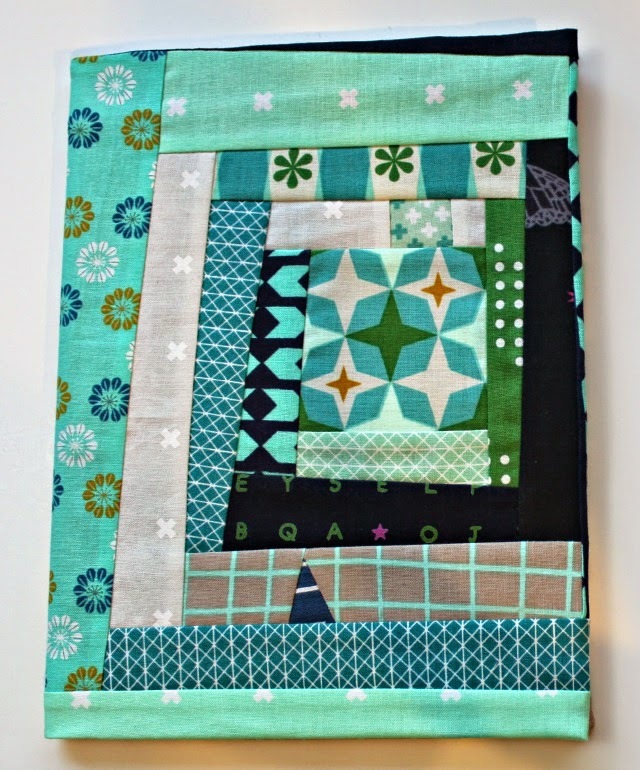 I was looking at their fabric last night and saw that one with the blocks and was loving it! It makes a great cover! Lovely - I like the one with the fussy cut flower . . . hopefully the giftees were properly grateful for your lovely gifts!! OMG!! These are sooo cute! I have several friends who love to sketch and doodle- I am going to have to make a few to share. I would be honored to win either of these: both are beautiful! Thanks so much for the inspiration and the chance to win one. They're all wonderful! I love the horses! The sketchbooks are wonderful. I especially love the flowers. I am from Minnesota, so anything remotely springlike is quite welcome!! 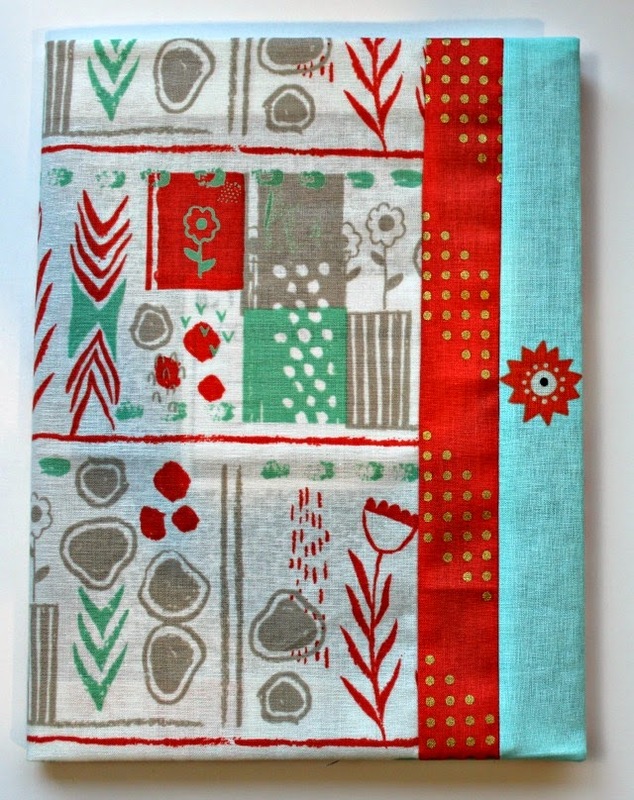 I love the melody miller fabric. I enjoyed watching your quiltcon experience on Instagram. Debbie, these are beautiful! I'd love the flower one. I've tried Rachel's tutorial and love it. These are lovely. I like the horses one especially. Definitely the horses for me Debbie! I love what you did with all of the sketchbooks. The horses would be fun. But so would the flowers. sigh. I can't make up my mind. Both are great, but I'll go with the flowers. Now I want to try the tutorial. Thanks for the chance.